It's easy to create a basic vegan French toast. Where it comes alive, however, is with the toppings you add. 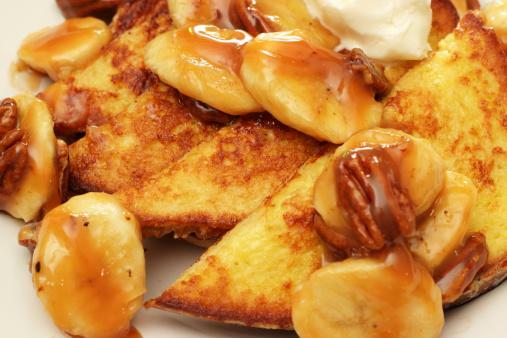 Try this tasty French toast with any (or all) of these delicious toppings. This is a basic, custard-like French toast with a slight neutral vanilla flavor and a hint of nutmeg. The trick is in adding ground chia seeds to give the custard some viscosity that normally comes from the eggs. Grind the seeds in a spice grinder for best results. Select thick slices of any crusty vegan bread for this recipe. You can also use a vegan sandwich bread, which will only need to soak for about a minute to absorb the custard. The recipe serves four. In a glass measuring cup, whisk together the almond milk, chia seeds and vanilla. Cover and let it rest in the fridge for about 10 minutes to allow the chia to thicken. Whisk in the agave and nutmeg. Pour into a shallow dish. Soak the bread (on both sides) in the custard for about five minutes to allow the custard to soak completely into the bread. Lightly oil a nonstick skillet and heat on medium-high. Add the bread, and cook until golden brown on both sides, about four minutes per side. Sprinkle with powdered sugar. Top with maple syrup, or as desired. 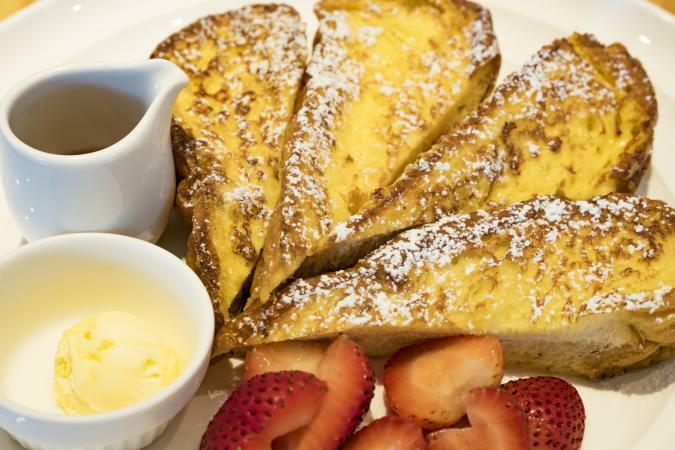 Add the zest of half an orange to give the French toast a lovely citrus flavor. Replace the nutmeg with 1/2 teaspoon of cinnamon or pumpkin pie spice. Add 1/4 cup of pumpkin to the custard, whisking well, before soaking the bread. If bananas Foster is your favorite dessert, try this tasty topping. Choose organic brown sugar to ensure it is not processed with bone char. In a large skillet, cook the bananas in the butter on medium-high until they start to brown. Add the brown sugar. Cook, stirring constantly until it boils. Add the rum, cinnamon and almond. Cook, stirring, for two minutes more. Serve spooned over the French toast sprinkled with pecan halves, if desired. 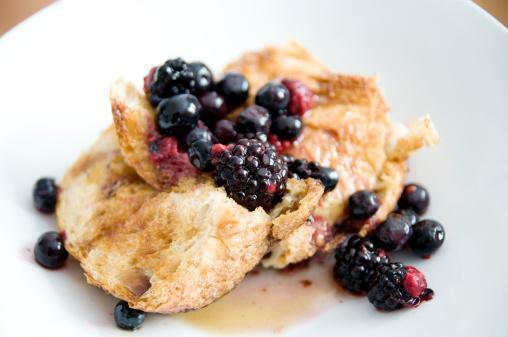 This simple warm berry compote is the perfect pair to your French toast. In a small saucepan, combine the blackberries, blueberries, agave and ginger root. Bring to a simmer on medium-high. Cook, stirring, for two minutes. Spoon over the French toast while it's hot. If you don't feel like doing much cooking for your topping, then this simple maple butter with sliced fruit is right up your alley. You can also add maple syrup, if you wish. In a small bowl or a mixer, mix together the maple syrup and butter. Spread it on the French toast. Top with the fruit and additional syrup, if desired. Apple butter is a delicious fall topping. Top with vegan ice cream and fruit of your choice. Whip up a batch of coconut whipped cream and top with that and some chopped macadamia nuts. 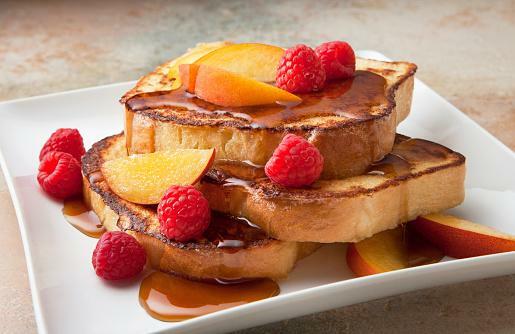 French toast is a versatile food; make it for breakfast or fancy it up with fruit and vegan ice cream for a tasty dessert. It's easy to make and even easier to top with the foods you love the most.